Mussel cuisine – it’s that time of the year again! 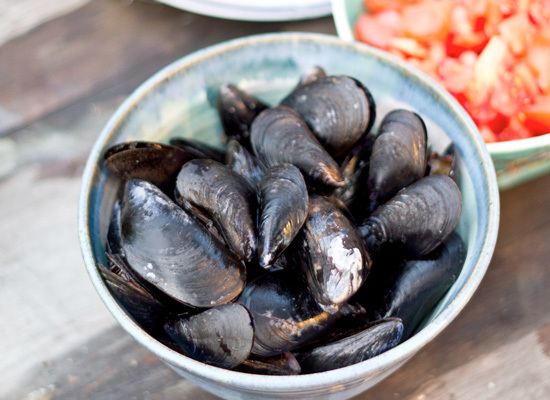 Mussel season is upon us again and this year has been deemed a vintage year for mussels. The port cities at which P&O Ferries make berth – France, Holland and Belgium are the acclaimed mussel eating centres of the world. So here’s our guide to getting some of the best mussels this winter. Although the classic mussel dish is of course moules frites – steamed mussels served with a side of French fries – mussel cuisine is incredibly ancient. Archaeological digs have found evidence that we have been eating them for over 20,000 years old, and in that time mankind has come to the conclusion that, however you cook mussels, they’re going to taste great. The recipe for French fries is Flemish in its origin. US soldiers in WW1 took a shine to them when they were in Belgium but since the main language there was French that was the name attributed to the fries. So don’t feel abashed if you find yourself in Brussels eating French fries. The other traditional part of the dish is the moules mariniere. Steaming the mussels in a broth of white wine, shallots, parsley and butter, really gives them a sumptuous taste. In Belgium this recipe varies considerably to the point where the mussels are cooked in the countries home-brewed pale beers. You’ll also be able to try them with garlic which is more common in France and certainly something not to be missed. Mussel season runs through the cold period of the year, from autumn to mid spring. The old-world setting that Europe has to offer is truly at its best in the winter months, the strongly brewed beers of Belgium rarely seem sweeter than when there’s frost on the panes and the country pubs have a crackling fires. Mussels also make a fortifying meal; they’re high in protein but low in fat so, if you can avoid chocolate and waffles but get some walking in, you won’t feel nightmarish once you get home either. A beautifully rustic restaurant facing the Lake of Love, can you beat that for romance? It’s placed on the old horse road routes, so there’s an antiquated feel to the setting that can only come from the sound of horses’ hooves clopping on cobbles. If the weather’s right then sit outside with a cold beer and a bowl of fresh mussels steamed in white wine – heaven. This establishment has been running for over 50 years. It’s an excellent spot to stop for lunch as it’s centrally located in the heart of Bruges. Famous for its seafood, mussel season is the time to guarantee yourself a perfect plate of moules. And if you’re feeling adventurous why not try their Moules Aphrodisiaque – Oh la la! The name translates as ‘The Horse Stable’ and has a 40 year old heritage. It is a great place for moules – although, these being the Netherlands, remember to ask for mosselen – and make sure you try them with curry, delicious. You’d do well to call ahead and make a reservation first though. Speaking of restaurants with heritage, the Chez Leon dates back to 1893. Their house beer, Léon, is served from the barrel and home-made. This is an impressive venue with two floors and a decor that really captures the sophisticated essence of Brussels; the perfect accompaniment to a bowel of delicious in season moules. Main-square restaurants tend to do so well because of their prime location. You are guaranteed high quality cuisine and attentive staff but they tend to be quite expensive. Mussels aren’t exactly a delicacy, they’re a food for the masses, market stalls sell them by the bagful and the first hauls of the year are celebrated with street festivals that leave behind vast hills of mussel shells. The locals know how to cook a good mussel, and there are plenty of independent restaurants which offer great value and tasty food. The ‘authentic’ Belgian mussel taste is sought after all over the world, there’s even a Belgian Café in Doha, Qatar – that’s how far out man’s taste has stretched for European-style mussels. France and the Netherlands also have a huge mussel culture. The main farming area on the coast of Holland, Zeeland, is the world’s main exporter of mussels, and a considerable amount of them end up in Belgium. France recently granted moules de bouchet (mussels grown in the bay of Mont St Michel) the appellation d’origine controlee (AOC). This distinction has previously been reserved for wines and cheeses, so it goes to show how much the French think of the mussels here. Moules de bouchot are highly sought after because of their firm orange/yellow flesh and strong taste. Some parting words on moules etiquette. The accepted way to scoop them out is by using the shell of a mussel rather than a fork. You won’t be burnt as a witch for having a preference for cutlery, but it’ll help you blend in to your surroundings a bit better.